It’s true, like the old bumper sticker said, that “God Doesn’t Make Junk.” But after 50 plus years of watching the people around me and daily looking in the mirror, it’s plain God certainly created his share of peculiar, screwy, and eccentric people. I think that’s one of the reasons I liked J. K Rowling’s main setting for the Harry Potter stories, “Hogwarts School of Witchcraft and Wizardry.” I felt right at home. Rowling peopled and staffed her school with bizarre and broken people. Outwardly handsome and cool but secretly unsure of himself, Gilderoy Lockhart, one of the many Defense Against the Dark Arts professors, was a fraud. And let’s not forget half-giant game keeper and failed wizard Hagrid or the sadistic janitor Argus Filch. Many of the students too are screwy. 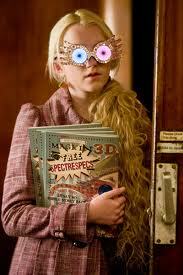 Luna Lovegood is loony, marching to a drum that may not even exist. Even the trio of Harry, Hermione and Ron are a bit odd. These people are largely dismissed by the “main stream” wizarding community but not by their Head Master equally strange Albus Dumbledore. In this Hogwarts reminds me of the church. After 30 some years involvement in the church, it occurs to me God too has peopled his community with peculiar, screwy, unconventional and downright broken people, myself not being the exception. Luna Lovegood would not have been friendless in most churches I’ve served. I won’t name the broken, bleeding, angry, confused and disillusioned. Rowling lends humor to her increasingly dark stories through fleshing out these eccentric characters. God, however, seems to attract them. As popular as Jesus is today, he hung out with a pretty unpopular, scraggly group back in the First Century. I feel at home, just like when I read Harry Potter, then when I read of these early peculiar, broken students in Christ’s school of life, or look around me in today’s church. You’ve met them too–or are one. The wonderful thing is God created such eccentrics and loves us despite our brokenness and he wants them/us to people his spiritual community called the church. This is where I find the pervasive philosophy in the modern church focusing on bright-shiny people false. Years ago I had a college professor who taught that because we were followers of Christ, we should be the best of the best, with the whitest smiles, nicest clothes, best grades. “God,” he said quoting the bumper sticker, “doesn’t make junk.” I bought it until I looked in the Bible or in the mirror again. Not that I equate, as he seemed to, offbeat, broken people with junk. God made no one expendable. Jesus died for every Lockhart and Lovegood among us. But, somehow, despite the church’s ability to be filled with outcasts and Jesus’ willingness to embrace them, this is not the demographic the church focuses on nor the image we portray. To our shame. When was the last time you saw a pastor preach or teach from a wheel chair? Or have any kind of visible disability? I recently attended a huge church planter’s conference where all of the speakers I heard were cool looking and pastored mega-churches. There was not a halting, unsure Harry Potter among them. Or closer to home, when was the last time you shied away from the Luna Lovegood or Gilderoy Lockhart in your life or church? You see, what I believe Rowling knows is that we’re all Lovegoods and Lockharts. We just don’t want anyone else to know it. So, we think surrounding ourselves with the cool and the smart and the successful will make it so for us too. What we often don’t see is that they too are not really bright-shiny either. But God knows our fears and failures and forgives them. God knows too our eccentricities and revels in them. This is where Hogwarts reminds me more of the church than the church does sometimes. man, you’re knocking it out of the park, good work. see you sunday morning at the neighborhood church.